Congratulations on your new AF. They are wonderful sounding and gorgeous to look at too. Congrats. BTW, you have a very understanding Boss to let you place the speakers between not 1 but 2 doorways. Yeah, we sometimes arm-wrestle for the 'sweet spot' listening chair, LOL! What's that funny looking thing between the two Futura's..the thing with the eyeball on top? Haha - I was wondering when I'd get that question! Am thinking about the Homage Vox for the center, but since most of the listening is actually stereo, I'm taking it one step at a time. At some point we may move the AFs to another room for 2-channel and put the 802Ds back here to have the matched set. Need to listen to some 5.1 music and get some time watching TV to see if we've got any issues with the mix. Since my rack is at the rear of the room, I'm considering to move my two L&R amps to the front and putting the middle speaker atop a low Salamander rack that would hold the amps. The space is too narrow for 3-across, and I don't want to stack the rack as that would impact the sound, according to the shop where I bought the AFs. Sorry, couldn't resist. I ended up with a Homage Vox and it works splendidly. The integration of audio and video has never been better. Not sure if it would make a huge difference in your case - and the Vox is a spendy puppy. There is no room for two systems in our new house so there is no turning back for me. I'd like to use the Vox for mono recordings but have to work out the whole pass thru deal with my C500. Then its a very good thing that the Futura's cast such a wide sound stage. Congrats on the Amati Homage Vox! 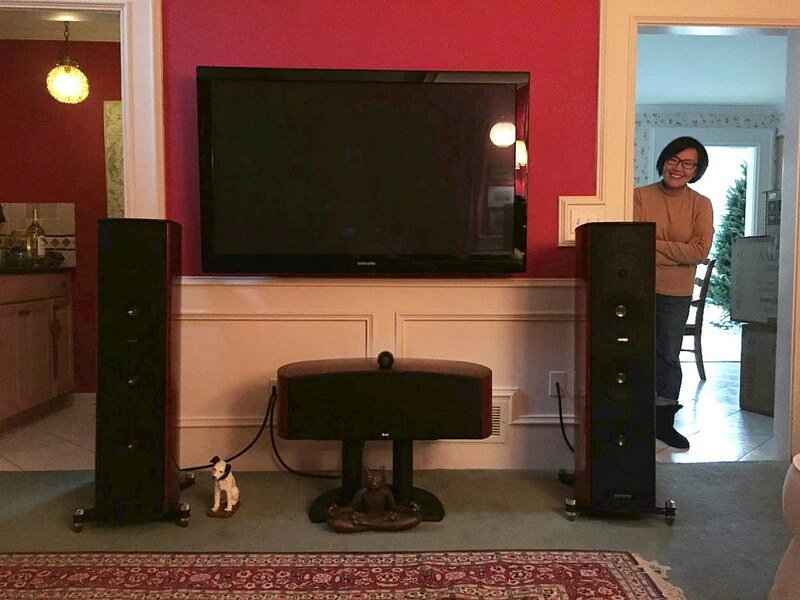 What a fantastic center channel speaker and a fine match with your Futuras.